These resources become a value-added all inclusive contract. When exterior or rooftop maintenance is required for your building, it is normally sent out to a general contractor for bid. 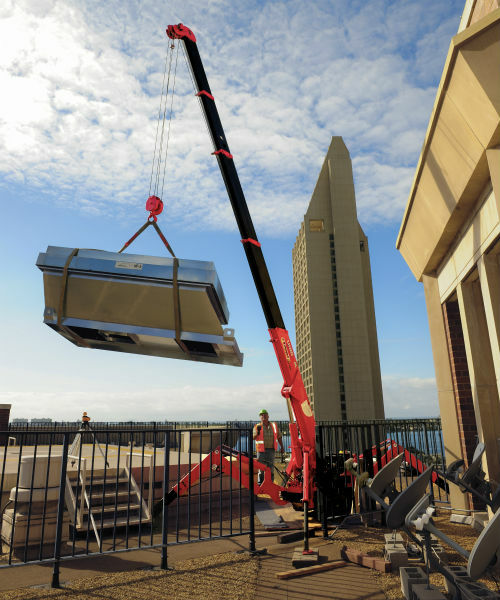 The work usually requires a crane company to provide a lift system from the ground or a hoist system from the top. Let Brewer Crane be your general contractor and provide you with the equipment and you will eliminate the additional contractor costs. As an added bonus we now have the “go anywhere” versatile mini crawler crane. The Mini Crawler Crane is able to drive up most stairs, turn in stairwells, roll into an elevator, and drive through a standard door. Applications include; but are not limited to, removal or replacement of an A/C unit, lower a manbasket over the edge for window maintenance, raise a manbasket to paint a flagpole or other elevated structure, and much more. equipment or service image to fill out our online quote form.